Some 450 canines are on election duty in India and many of them have died due to heat stroke. Working in sweltering heat, putting life and limb at risk, the hard working dogs have sniffed out about 221 kg of explosives in the form of IEDs across states in India. But this has taken a toll on them as many of them could not take the rigours of the mammoth task. 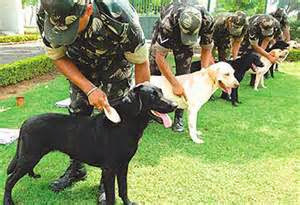 One of these dogs Brandy, a Labrador serving with the Central Reserve Police Force, detected about 40 kg of explosives. Thrice last year, he saved the lives of the security personnel by detecting explosives in the nick of time. Sadly, Brandy died on March 24. According to doctors, the cause of his death appears to be heat stroke. Some other dogs, Pinky and Silky, too died in April this year due to heat stroke. Despite the difficulties and the fatalities, these loyal dogs continue to carry out their duties. But is it ethical for the security forces to overwork these dogs so much that they have to die saving human lives? Is the life of a dog less precious than the life of a human? Can't the number of these working dogs be not increased to lessen the woes they suffer at the hands of the people who value only human life as a life?